Myth - Water damage can be avoided in hotel design as long as some type of waterproofing membrane is installed over a concrete slab. Truth – Unfortunately, the issue is not as simple as that. In fact, many factors must be considered when waterproofing a concrete slab base. Using a waterproofing membrane over a concrete slab, which is often topped by a mortar bed and stone or similar overburden, is just the starting point. In addition, the membrane must be sufficiently robust to do the job, and drainage must be adequately thought out. Installing a marginal membrane or an inadequate drainage system will often lead to membrane failure and cause the building to leak, especially in climates with heavy rainy seasons. 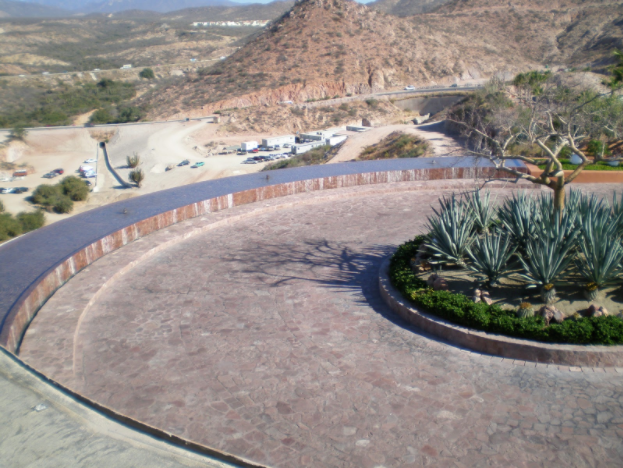 Case Study – LBFG observed a failure of this sort at a resort built into a mountainside in Mexico. The design team for the project was a collaboration between U.S. and Mexican firms. The entrance to the resort was located at the top of the mountain, and the remaining portions of the facility were built down the side of the mountain, utilizing multiple terrace-like levels. As such, most of the common areas were open-air terraces over occupied space below. Figure 2: The extent and magnitude of the leaks were such that an elaborate system of gutters and drain piping had been installed below the slabs in an attempt to intercept and manage the leakage. Waterproofing over occupied space is a critical but often misunderstood and overlooked aspect of building envelope design in hotels and resorts. Despite the presence of a waterproofing membrane on the elevated concrete slabs, water intrusion occurred through the terrace levels into the spaces below, infiltrating via penetrations and cracks in the slab (Figure 1). The extent and magnitude of the leaks were such that an elaborate system of gutters and drain piping had been installed below the slabs in an attempt to intercept and manage the leakage (Figure 2). The structural slabs onto which the waterproofing had been applied were nominally flat, lacking positive slope to drain. No drainage layer was provided between the waterproofing and overburden, restricting subsurface drainage. The waterproofing systems applied to the structural slabs incorporated fluid-applied asphalt and urethane-based products that had poor resistance to ponding water. The waterproofing membranes had been applied below the required minimum thicknesses. Penetrations and terminations of the waterproofing were not detailed properly. The waterproofing membrane had been damaged during construction due to inadequate protection. LBFG determined that the leakage had occurred as a result of marginal waterproofing products installed over a poorly drained structural slab, aggravated by improper installation and damage during construction. The motor lobby of the property included a circular drive with an adjacent water feature (Figure 3), portions of which were over occupied space. 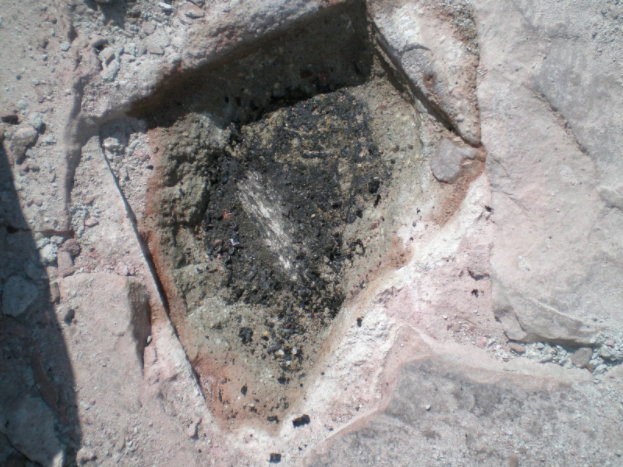 An exploratory probe of the drive area revealed a black waterproofing membrane with an overburden of approximately 3" mortar-set pavers (Figure 4). Further examination revealed that the pavers had been set directly over the waterproofing, with no protection course over the membrane and no separate drainage layer or drain mat to facilitate drainage at the waterproofing level. The waterproofing itself was applied in minimal thickness to the concrete slab. with no integral reinforcing (Figure 5). Figure 3: The circular drive and adjacent water feature were over occupied space. Figure 4: Mortar-set pavers were installed directly over waterproofing, with no protection course or drain mat. Figure 5: The waterproofing membrane had minimal thickness and no integral reinforcement. Failure by the multinational design team to consider differences in construction cultures and local product technologies. While the local designers and contractor may have successfully used these products on prior projects, the foreign architect had created a design condition that was unfamiliar to the local team and which required different performance characteristics. Use of an otherwise well-performing product in an inappropriate application. The waterproofing product used on the elevated slabs was suitable for other water management applications, but unfortunately was not appropriate for the specific conditions of this project (i.e., waterproofing a relatively flat slab that had poor drainage and significant overburden). Furthermore, the project team did not adequately engage the manufacturer during the design and construction phases to flag potential incompatibilities. Failure to integrate and execute an effective internal review process during the design and construction phases that would have caught these errors before the products were installed or applied. A third-party design review should have identified improper product specifications before they were submitted. Additionally, both the general contractor and design team should have flagged the unsuitable products during the submittal review process if their review had gone deeper than a cursory approval of specified systems. Provide positive slope to drain at the subsurface slab level onto which waterproofing membranes will be installed. Provide a drainage layer/drain mat between the waterproofing and overburden. Utilize waterproofing products that can tolerate poor drainage and ponding water. Ensure that detailing at penetrations and terminations are adequately addressed during both design and construction. This can include peer review of the contractor’s submittals by a waterproofing consultant prior to installation, as well as quality assurance inspections and testing by a consultant during installation. Ensure that the integrity of the waterproofing membrane is verified before overburden materials are installed, preferably by both visual observations and water testing. Ensure that multinational design and contractor team members over-communicate and fully understand the potential novel ways in which locally-familiar products may be used that exceed the performance capabilities of the products. Ensure waterproofing products are approved for the specific application for which they are intended to be used. Have the manufacturer involved early on in reviewing the design documents to ensure product selection is appropriate. Require periodic manufacturer QA site visits during construction. Develop and implement a waterproofing QA program during the design and construction phases to identify potential errors early in the process. This should include third-party review of the design documents by a waterproofing consultant, as well as third-party review of the submittal documents and site inspections during installation. George H. DuBose-CGC; Steven R. Gleason, P.E. ; and Charles Allen, Jr., AIA are all building experts at LBFG. Steve Gleason, a Senior Forensic Engineer at LBFG, has more than 25 years of experience in construction consulting on over 500 projects ranging from residences to over 70-story high rises, many related to moisture intrusion and building envelope failures. Chuck Allen, a Forensic Architect at LBFG with expertise in building envelopes and roofing and wall systems, has applied his expert architectural knowledge and cutting edge technological skills on some of the largest and most complicated building failure projects in the world.